With so many beauty trends from one season to the next it is sometimes hard to keep up, but one trend that has been around for a few seasons now is to have flawless skin. 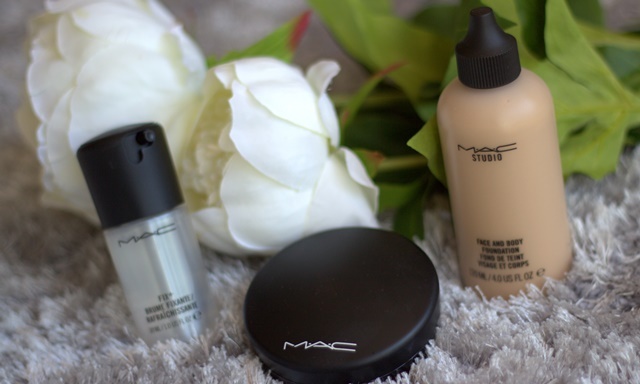 Yes…it is still ‘all about that base‘ I will be doing a video on my favourite five foundations very soon but I wanted to start off with this MAC flawless base trio that works so well for me. Even though it’s a cult beauty favourite amongst make-up artists, bloggers and beauty addicts alike I’m not a huge fan of the Studio Fix foundation. I find it a bit too heavy and find that I am between shades which is always annoying and a lot of effort on an everyday or even going out basis. I am still a HUGE fan of MAC though so I knew they would have the right combination for me somewhere in the ever growing range. Starting with the Prep + Prime Fix + this helps to set the base for smooth make-up application whilst refreshing my face. I also sometimes use it to just refresh my make-up after a few hours. Then for some lightweight coverage I use the Face and Body Foundation in the shade C2, this gives a light to medium coverage and is water-based. Itt gives a long-lasting satin finish to my skin and on days when I feel I need a little more coverage I can just add a second layer but my skin still feels like it can breathe as the product is buildable. On the contrary, if I am going for one of those ‘no make-up, make-up days’ I mix a little bit of this in with my moisturiser and it looks fabulous and flawless. This can be worn alone without powder but I prefer a matte finish and find that I tend to get shiny on my t-zone throughout the day, so I use my trusted Mineralise Skinfinish Natural which is such a gorgeous lightweight powder. It simply takes away shine without changing the colour of your foundation. I find this powder blends everything well without looking cakey, if you have seen my YouTube videos I have used this a countless number of times in my tutorials. To finish off, I spritz my face once again with the Prep + Prime Fix + to just set my base and keep it looking fresh for longer. I wouldn’t say this is a setting spray as such but it keeps my skin hydrated and keeps my make-up looking fresh.